And the answer actually depends on you. If you ask me though, I give it a maybe. For starters, finding this little hole in the wall of Glorietta was a pain because it was literally a wee hole in the wall. All right, more like the shelf you DIY on a wall when you make the New Year’s resolution to clean up your room—that’s how accidental and cramped it looked. 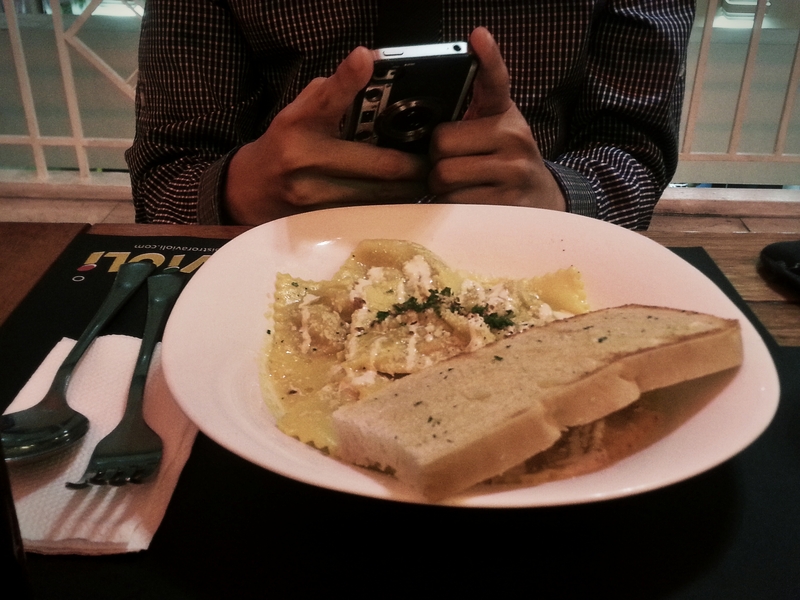 The good thing though is that while I was painstakingly typing this, I learned that the Greenbelt 1 branch has opened, giving Bistro Ravioli more breathing space and hopefully, less looking like Harry Potter’s room and more of a restaurant which it really is. If you’re walking from Glorietta though, the “walk” can be torture especially during rush hour. As for the food, if you think that ordering Ravioli is your saving grace, the answer may vary depending on your appetite, gourmet expectations, company and budget—the last 2 equally important to taste! The waiter-server-or-perhaps-manager suggested their bestseller Italian Sausage Ravioli in Romesco Sauce which I opted not to follow because I’m part vegetarian, and even if I do eat meat, I don’t want a meaty ravioli. It just doesn’t seem respectful to eat ravioli alongside blatant meat. As for me, the eternal green beckoned and I ordered the Spinach and Feta Cheese Ravioli in Pasta Sauce, which when unearthed, revealed roasted tomato slices peeking from the bottom—that for me was a delightful present. Topped with pesto and bathed in pomodoro, this beats team saffron anytime. At first glance this P245 dish seemed too little for hungry me, but after engulfing loads of carbs—three quarters through the meal, a sense of fullness developed. Did I mention that I even donated my garlic bread to the hungry? 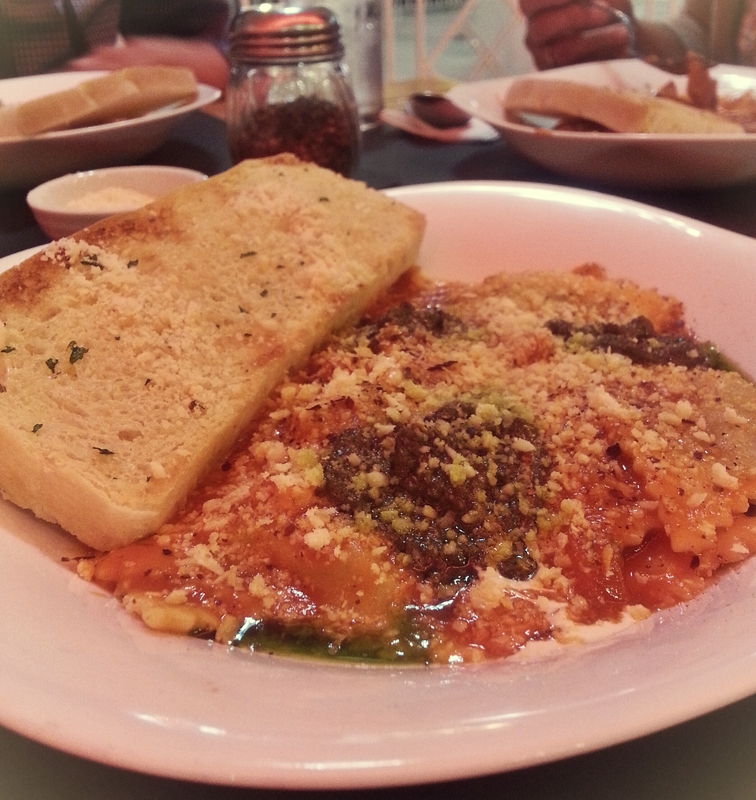 Sans the garlic bread and extra order of pizza (boo, I know), Bistro Ravioli’s ravioli was filling enough on its own. The flavor was all right for that hole in the Glorietta wall joint and I did manage to enjoy the burst of spinach-feta goodness. Of course other more expensive restaurants would offer the more gourmet ravioli but at least this offering was not ordinarily mainstream, if you know what I mean. If I return, it would be in that Greenbelt branch (hello sunshine and air) and I might try that Salmon in Saffron Sauce. There’s also that three cheese ravioli. And there’s pizza too. Oh dear, someone better get hungry fast. I do agree in the glorietta branch. It is ridiculously cramped and just too open that I feel people can accidentally bump in to you while you’re eating. Hi, apparently the branch is so new, the website and fb page have not been updated! 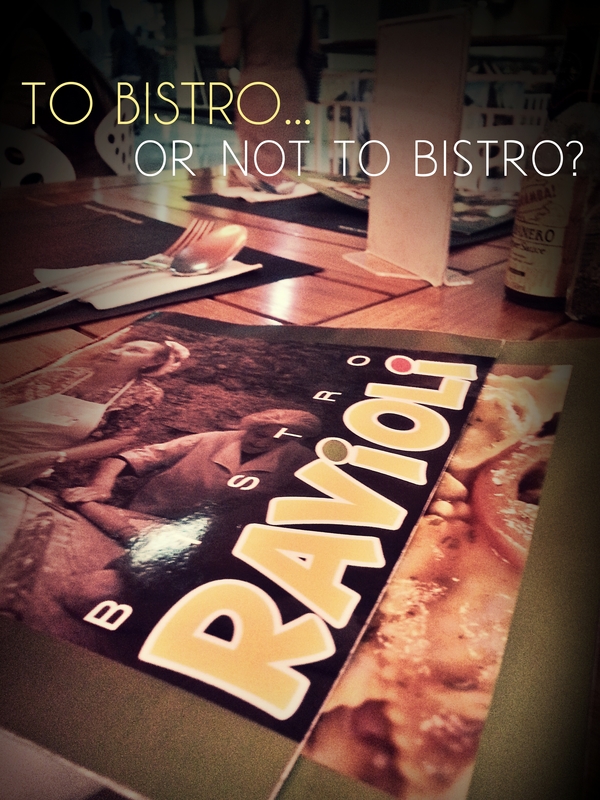 =) Best to email info@bistroravioli.com or drop a note in Facebook. Thank you Lazyblackcat. 🙂 I already left a message on their FB account and emailed them but still no response. I don’t know how will I make a reservation. Oh dear, walk in? I’ve run out of ideas 🙂 I had my friends come in early which is why we secured a decent table. Good luck!